Adelodun, Victoria O.; Elusiyan, C. A.; Olorunmola, F. O.; Adewoyin, F. B.; Omisore, N. O.; Adepiti, A. O.; Agbedahunsi, J. M. & Adewunmi, C. O. 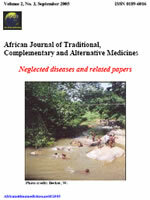 The extracts of nine selected Nigerian medicinal plants were investigated on Trypanosoma brucei brucei infected mice. The anti-inflammatory properties of hexane fraction of the most promising U. chamae extract was assessed by acute oedema of the mice paw model while the modulatory effect of the extract on Delayed-Type Hypersensitivity (DTH) response on in vivo leucocytes mobilization was evaluated. ‘Dose- probing acute toxicity tests’ established an oral and intraperitoneal LD50 for T. ivorensis stem bark as >1600 < 5000 mg/kg and 100 mg/kg respectively, while the oral LD50 of Uvaria. chamae was >5000 mg/kg. Extracts of Khaya senegalensis , Harungana madagascariensis , Terminalia ivorensis, Curcuma longa , Ocimum gratissimum and Alcornea cordifolia showed weak anti-trypanosomal effect and did not exhibit significant clearance in parasitemia at the test dose administered compared with the positive control (Diminal®). However, the leaf extract of U. chamae and its hexane fraction demonstrated a significant response (P < 0.01). The fraction at 1000 mg/kg inhibited oedema by 107%. Uvaria. chamae demonstrated both anti- trypanosomal and anti-inflammatory properties by increasing the survival time of infected mice due to reduction in parasitemia caused by T. brucei brucei.